These scones are quickly becoming a favourite in our house. They make a perfect light breakfast or perhaps a cheeky afternoon snack. They are so lovely and light, but the best part is that they are a cinch to make! 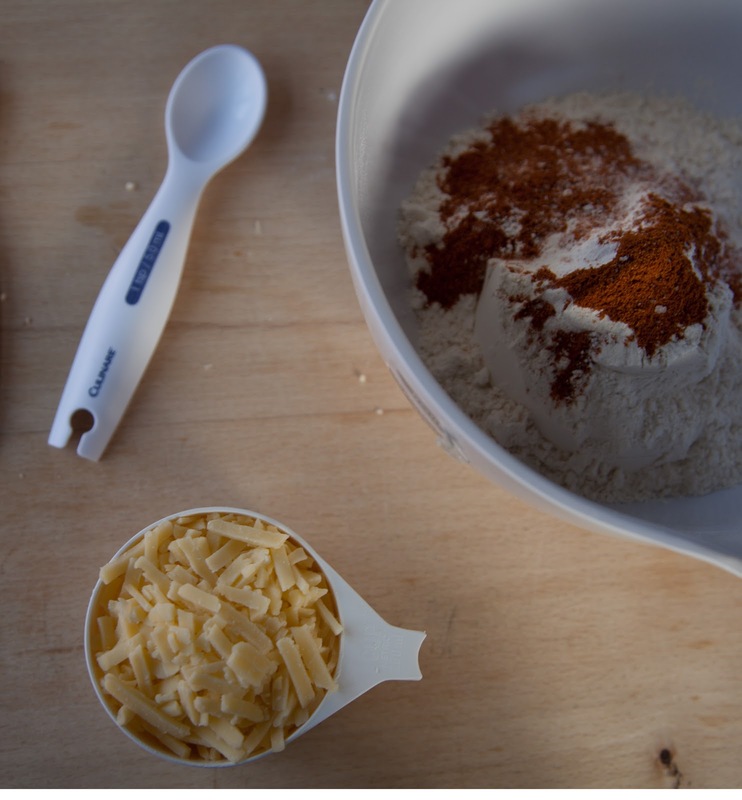 In a large bowl, sift together all of the dry ingredients. Add the cheese and mix through. In another (smaller) bowl, whisk the egg and milk together. Add the oil and whisk again. Finally add the wholegrain mustard and whisk. Pour the egg mixture into the flour mixture and mix with a spoon until the mixture comes together. If the mixture is too dry, add a little more milk. Roll the dough out onto a floured surface and roll it out so that it is about 2cm thick. I just use my hands to do this, rather than a rolling pin. 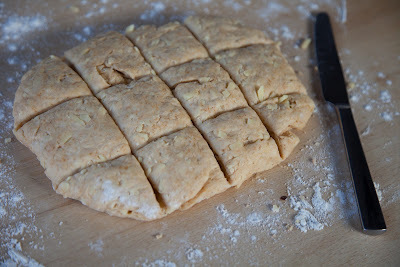 I like to shape the mixture into a rough rectangle and then cut the dough to mark the scones. 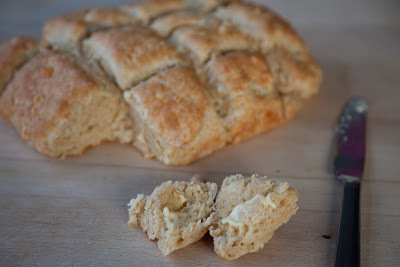 This will make it easy to separate the scones once they have been cooked and it is so much easier than cutting out each scone with a cookie cutter. Place the shaped & cut mixture onto a baking tray and bake for about 30 minutes. If you prefer to cut out your scones individually rather than baking as a single slab, they will probably only need 15-20 minutes in the oven. For my first batch I went with 1 1/2 tsp of cayenne, which I think was too much. They had a lovely spice to them, but I think the pepper overshadowed the cheesy-ness too much. For my second batch I used mustard powder. But I think that using wholegrain mustard gives a better result. I think these will be great for breakfasts on the run. Don't suppose you've tried them with wholemeal flour? I've not tried the recipe with wholemeal flour yet, but that might have to be my next variation!